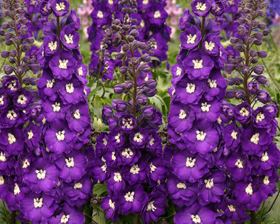 This New Zealand Delphinium introduction is the one you must grow! Deep purple 8cm across fully double blooms with a purple-and-white striped "bee" (that central cluster of petals in each flower) open in great numbers for 3 months or more on super-vigorous plants that are specially bred to stand up to heat and humidity. Cut them for the vase or let the hummingbirds enjoy them in the sunny garden! Sow February to June or September to October. Sow seed on the surface of lightly firmed, moist seed compost in pots or trays. Cover with a fine sprinkling of compost or vermiculite. Keep at a temperature of between 10-15C. After sowing, do not exclude light as this helps germination. Keep the surface of the compost moist but not waterlogged; germination can take 21-40 days. When large enough to handle, transplant seedlings into 7.5cm pots or trays. Gradually acclimatise plants to cooler conditions for a few weeks before planting out after all risk of frost, 60cm apart.